Active Products isn’t a name that immediately springs to mind when thinking of head torches. However this little torch with its interesting features might be worth a look for easy trail running. Those of you who know the Alpkit Manta will instantly recognise its design and whilst it shares some features it has some differences too, not least a built in motion sensor that lets you switch it on and off with the wave of a hand. The key features of the AP Pro include the smooth dimming function: rather than clicking through a series of brightness settings you press and hold the on / off button and the torch cycles through 100 lumens down to 10. You simply release the button when you have found your desired brightness. The focus can be manually adjusted from spot to wide beam by moving a lever above the lens. This is particularly useful when you need to change from illuminating the ground immediately in front of you to looking further ahead – for example looking for the gate or stile where your path exits the field. As well as the main 100 lumen Cree the torch has 2 smaller red LEDs that work in either constant or flashing SOS modes. The stand out feature of the torch is the second button that switches to motion sensor mode: press this and the torch can be switched on and off by waving your hand in front of the lens. It’s an interesting feature that might be useful for people wearing big gloves but I haven’t quite worked out where I might use it whilst night running, I certainly wouldn’t want to inadvertently plunge myself into darkness whilst on the hoof! 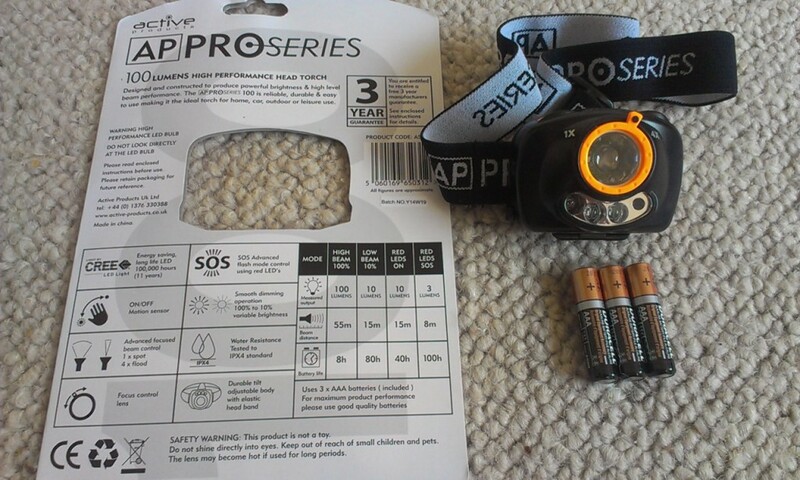 The 3 AAA batteries (supplied) are housed within the main unit and so all the weight is on the forehead although at 109g this isn’t too much of an issue. A piece of foam protecting your forehead and the single, adjustable elasticated headband give a comfortable fit and the head unit can be angled down through 8 notches on a seemingly secure ratchet to give varying angles of illumination. Battery life on full power is claimed to be 8 hours, however this doesn’t mean you will get 100 lumens all the way through an 8 hour night run! The torch feels sturdy and is designed to last as Active Products give a 3 year guarantee. All in all, a neat little torch suitable for non technical trail running, just remember though – if you set it to motion sensor don’t go wiping the sweat from your brow as you run, your lights will go out! 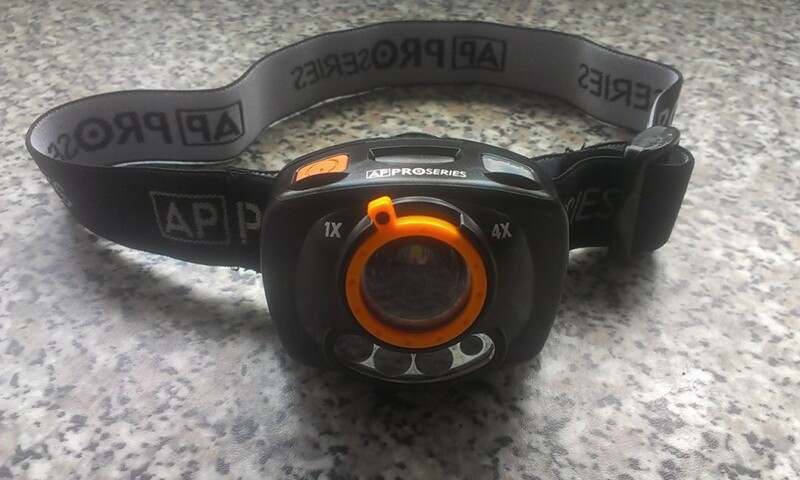 Posted in Equipment, Head Torches, Reviews, Trail Running and tagged head torch.